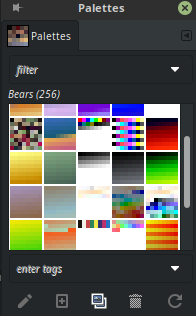 The Import a New Palette dialog has a few controls, but these are straightforward. Firstly click the Image radio button and then the drop-down menu beside it to ensure that you have selected the image you wish to use. If you have made a selection to select just part of the image, click the Selected Pixels only tick box. Here is a record of the steps you already pointed out. The mentioned image radio button is inside the Import Palette... dialog. It seems like you have not opened that dialog so far and therefore couldn't find the radio button. Not the answer you're looking for? Browse other questions tagged color gimp or ask your own question. In GIMP, how to use an image as colormap (or gradient, or palette)?